President Obama and First Lady Michelle Obama put MLK’s challenge into action at Leckie Elementary School in DC as a way of honoring MLK’s legacy, and to give back to their community. A group of AmeriCorps members serving at Reading Partners Washington, DC, in collaboration with other AmeriCorps members, high school and elementary school students, and parents, served alongside the President and First Lady to celebrate MLK Day of Service. The group spent several hours filling backpacks with books that celebrated Black History Month, eating healthy, and national service. The backpacks would be given to children in high-need schools in the DC area. 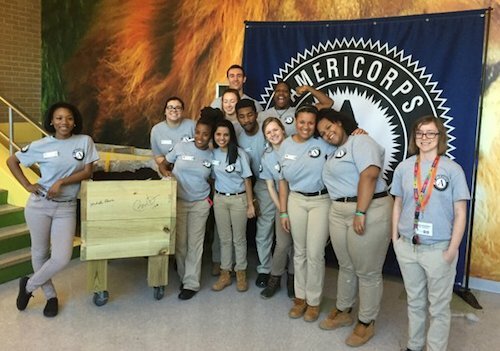 Find out what some of the Reading Partners AmeriCorps members had to say about their day of service with the President and First Lady. What was your favorite memory from the MLK Day service project? Sam Jacques: My favorite memory from the MLK service event was when we finished packing all of the bags and the President gave out high fives. Then we huddled together and he called us his team. For me it emphasized that servicing communities is a team effort as well as demonstrated the great value the President places in the work people like AmeriCorps members do everyday. What will you tell your students about serving alongside the President and First Lady? Sam Jacques: I have told my students that my MLK day of service was very special. I got to serve with the President and First Lady. I told them that it was a really cool experience and it was a great honor to be in their presence. I also mentioned that the fact that I received the opportunity to volunteer right next to the President was because I had answered the call to serve in their school this year. Ricky Smith: I will tell students with whom I interact with about serving with the President and First Lady that they are just normal people like you and me trying to make the world a better place by serving the community. Erika Brosnihan: I received half of the books that were leftover from the service project. When I give a student one of those Dr. Seuss books, I’ll tell them it is from Obama. Did you get to talk to the President or First Lady? What did you talk about? Ricky Smith: I spoke briefly with the President and the First Lady. I shook the First Lady’s hand and she replied “That’s a firm handshake!” to which I replied sheepishly “I know, I practiced shaking hands with several different people before meeting you for this moment actually!” My interaction with the President was quick during a high five session after we finished packing bags with books and other materials. “Don’t miss!” I yelled to the President as he raised his hand. “I never do!” he said laughing. Tell us what you hope to accomplish during your year of service. Sam Jacques: For the last semester of my 2015-16 year of service I hope to make a lasting impact on my students’ lives. I want them to be as close to reading on grade level as they possibly could be as well as instill in them a love for reading. Many of my students enjoy coming to the reading center, but I want them to know that it’s not just in the reading center that reading can happen. It can happen anywhere and that they should grow to love reading. Ricky Smith: In the next year of service I hope to continue my work in any way in the community by helping to develop and strengthen new and existing programs. Additionally working in a government capacity to allow different opportunities for more civilian to government official interaction like we had on the MLK day of service. What are your plans after you finish your year of service? Sam Jacques: After my year of service I will return to Atlanta and hopefully continue to do social action and community work. I hope to take the skills I have gained during my year of service and continue serving other communities. I would also like to go back to graduate school to gain even more knowledge and find a balance between academia and implementing visible change. Ricky Smith: After my year of service I hope to intern for CNCS during the summer and continue another year of service with an AmeriCorps organization. Additionally I am taking the Foreign Service Officer Test so that I can continue to do service not only here in the States but abroad as well as a Foreign Service Officer for the rest of my life. Erika Brosnihan: Do another year!